Please feel free to explore the following sites on Andersonville. If you have or find additional information on these men, please let us know! Department of Washington, Department of Va. & N.C. Cause of Death: DIARRHEA C.
Dept. of Va. & N.C.
captured Feb. 2, 1864 at Beech Grove, on Neuse river, N.C.
"During my stay in New Bern we had a line of [signal] stations connecting Gen. Peck's headquarters in New Berne with Fort Anderson on the opposite side of the Neuse River, and with Fort Gaston on the south side of the trent; also with Fort Totten on the outskirts of the city." 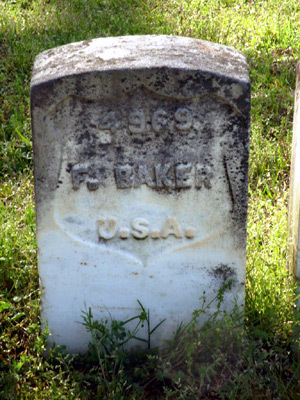 "We also had a field signal telegraph line in operation between New Berne and Batcher Creek, an outpost held by us some eight miles from New Berne in the direction of Raleigh, N. C. To the right and left of the outposts at Batchlor's Creek, Lieutenant Fricker had caused a wide swath to be cut through a dense turpentine or pine swamp, both to the Neuse and Trent Rivers, where we also had outposts." "Through the openings thus cut from the Neuse to the Trent, a distance of some six or seven miles, communication was kept up along our advance line of outposts, by flag and torch. This was a very important service, and in my judgement ultimately resulted in saving from capture the entire Union force stationed at Batchelor's creek, consisting of some 1,200 men. Gen. Pickett, it was, I believe, who with his division attempted to surprise New Berne, Feb 1, 1864, at the time Washington, N. C., was captured and the Ram Albemarle created such havoc among our gunboats." "Our outpost on the Neuse river, consisting of about one hundred and fifty men, including Sergt. 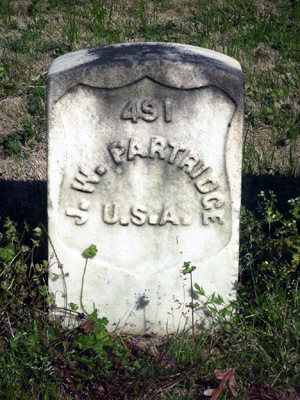 Preston A. Champney, and Privates John W. Partridge and Frank T. Baker of the Signal Corps, was captured on this occasion, but warning was given by signal to the outposts at Batchelor's Creek, and on the Trent river, in time to prevent their being flanked and captured." Enlisted Jan. 28, 1864; Indiana, Pa.
Enlisted Jan. 4, 1864: Indiana, Pa. Captured: Middletown, Virginia, May 13th, 1864. "During the 19th and 20th of June , our forces fell back, the enemy pursuing and pushing us hard. After passing Burford's Gap, a halt was made. Capt. Town threw out [signal] parties of observation upon the surrounding mountians. The party on the left under Lieut. Muhleman was attacked and compelled to fall back, losing privates Best and Cunningham, who were captured, having straggled from camp. 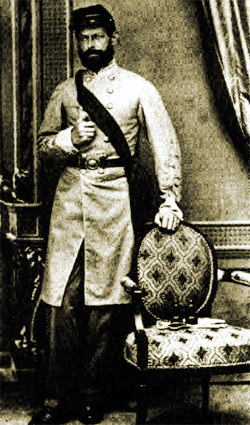 In November of 1863, Confederate Captain W. Sidney Winder was sent to the village of Andersonville in Sumter County, Georgia, to assess the potential of building a prison for captured Union soldiers. The deep south location, the availability of fresh water, and its proximity to the Southwestern Railroad, made Andersonville a favorable prison location. In addition, Andersonville had a population of less than 20 persons, and was, therefore, politically unable to resist the building of such an unpopular facility. So Andersonville was chosen as the site for a prison that would later become infamous in the North for the thousands of prisoners that would die there before the war ended. 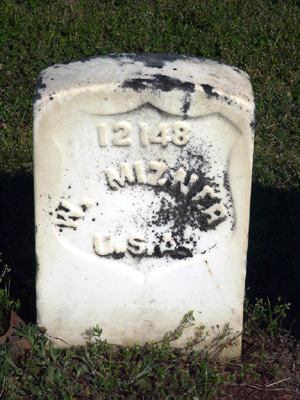 After the prison site was selected, Captain Richard B. Winder was sent to Andersonville to construct a prison. Arriving in late December of 1863, Captain Winder adopted a prison design that encompassed roughly 16.5 acres which he felt was large enough to hold 10,000 prisoners. The prison was to be rectangular in shape with a small creek flowing roughly through the center of the compound. The prison was given the name Camp Sumter. In January of 1864, slaves from local farms were impressed to fell trees and dig ditches for construction of the prison stockade. The stockade enclosure was approximately 1,010 feet long and 780 feet wide. The walls of the stockade were constructed of pine logs cut on site, hewn square, and set vertically in a wall trench dug roughly five feet deep. According to historical accounts, the poles were hewn to a thickness of eight to 12 inches and "matched so well on the inner line of the palisades as to give no glimpse of the outer world". A light fence known as the deadline was erected approximately 19-25 feet inside the stockade wall to demarkate a no-man's land keeping the prisoners away from the stockade wall. Anyone crossing this line was immediately shot by sentries posted at intervals around the stockade wall. Included in the construction of the stockade were two gates positioned along the west stockade line. The gates were described in historic accounts as "small stockade pens, about 30 feet square, built of massive timbers, with heavy doors, opening into the prison on one side and the outside on the other". Each gate contained wickets (door-sized entryways). Prisoners began arriving at the prison in late February of 1864 and by early June the prison population had climbed to 20,000. Consequently, it was decided that a larger prison was necessary, and by mid-June work was begun to enlarge the prison. The prison's walls were extended 610 feet to the north, encompassing an area of roughly 10 acres, bringing the total prison area to 26.5 acres. The extension was built by a crew of Union prisoners consisting of 100 whites and 30 African Americans in about 14 days. On July 1, the northern extension was opened to the prisoners who subsequently tore down the original north stockade wall, then used the timbers for fuel and building materials. By August, over 33,000 Union prisoners were held in the 26.5 acre prison. 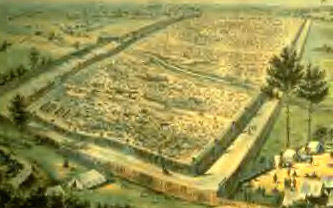 Due to the threat of Union raids (Sherman's troops were marching on Atlanta), General Winder ordered the building of defensive earthworks and a middle and outer stockade around the prison. Construction of the earthworks began July 20th. These earthworks consisted of Star Fort located southwest of the prison, a redoubt located northwest of the north gate, and six redans. The middle and outer stockades were hastily constructed of unhewn pine logs set vertically in wall trenches that were about four feet deep. The middle stockade posts projected roughly 12 feet above the ground surface and encircled the inner prison stockade as well as the corner redans. The outer stockade, which was never completed, was meant to encompass the entire complex of earthworks and stockades. The posts of the outer stockade extended about five feet above the ground surface. 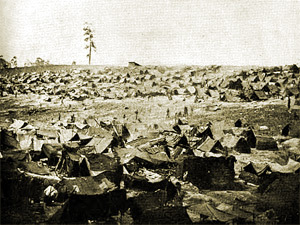 By early September, Sherman's troops had occupied Atlanta and the threat of Union raids on Andersonville prompted the transfer of most of the Union prisoners to other camps in Georgia and South Carolina. By mid-November, all but about 1,500 prisoners had been shipped out of Andersonville, and only a few guards remained to police them. Transfers to Andersonville in late December increased the numbers of prisoners once again, but even then the prison population totalled only about 5000 persons. The number of prisoners at the prison would remain this low until the war ended in April of 1865. 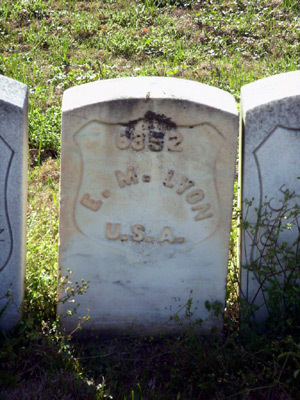 During the 15 months during which Andersonville was operated, almost 13,000 Union prisoners died there of malnutrition, exposure, and disease; Andersonville became synonymous with the attrocities which both North and South soldiers experienced as prisoners of war. 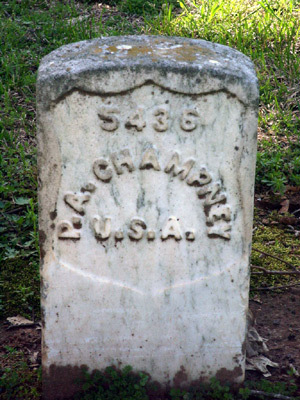 After the war ended, the plot of ground near the prison where nearly 13,000 Union soldiers had been buried was administered by the United States government as a National Cemetery. The prison reverted to private hands and was planted in cotton and other crops until the land was acquired by the Grand Army of the Republic of George in 1891. During their administration, stone monuments were constructed to mark various portions of the prison including the four corners of the inner stockade and the North and South Gates.